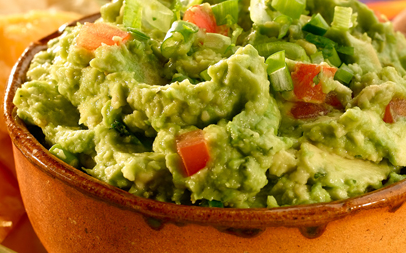 Guacamole is a simple and deliciously healthy Mexican dip. There are many recipes for it; some call for more tomatoes and some advocate using more avocado, I prefer the latter cos I love avocado. Make sure you find ripe soft avocados for this, because unripe ones will ruin this otherwise delicious and healthy dip. 3 soft ripe avocados, scooped and mashed. 1 large ripe red tomato, finely chopped. A slack handful of coriander leaves, finely chopped. 1 red chilli pepper, deseeded and finely chopped. Assemble all the ingredients in a bowl and mix well, adding salt and freshly-ground black pepper to taste. Serve with crispy tortilla chips or nachos, sour cream and salsa. This recipe is dedicated to Lauren, Lewis and Jamie.